Biography: Sarah is a Chartered Health and Safety Practitioner by profession. 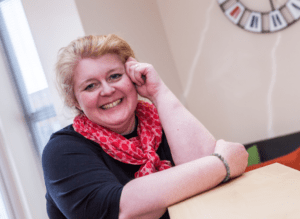 She founded the bespoke Health and Safety Consultancy The RedCat Partnership Ltd in 1999, after she found that helping people suited her skill set & personality more than the Enforcement work she was doing! RedCat needed a bigger home with its own Training Rooms, so she opened No8 Thorpe Road in 2014. This provided for RedCat’s needs, but also a wider need for a modern, town centre professional business space. Extra office capacity is let out as both permanent office space, hot desking and with the impressive suite of 4 meeting/training rooms to hire. No8 offers an exceptional personal service, including catering which is prepared on site using Norfolk’s larder of fine ingredients. No8 has impressive ethical & environmental credentials, being the holder of a Silver Carbon Charter.